WELCOME! to the Schoolcraft County Sports Fishing Association website. We'll use this site to get the word out on our organization and create a better sense of community among our members. We'll also include pictures of our work and members. 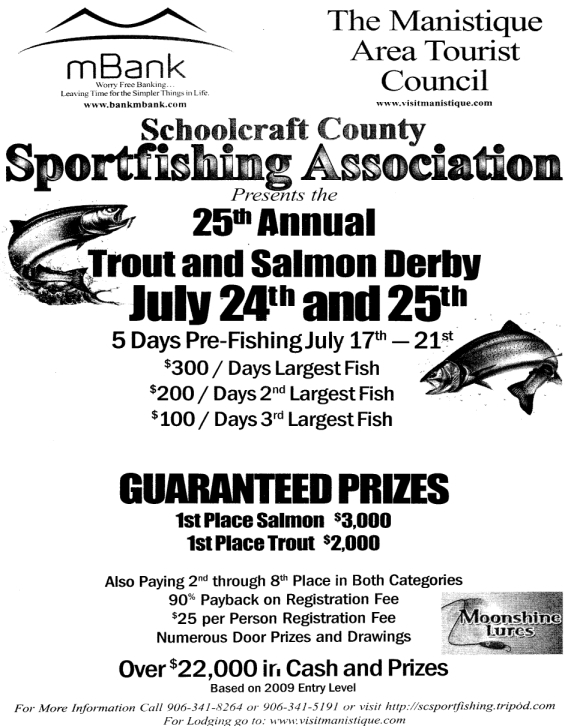 The Schoolcraft County Sport fishing Association is currently on a mission to expand it's annual tournament event to bring it's community and visitors abroad an outstanding five days of fulfilling excitment and events, and of course fishing. The tournament enteries have grown substantualy over the past few years and continues to grow each year. In turn we strive to expand our tournament events and prizes awarded to make the "Schoolcraft County sport fishing Tournament" one of the best annual events in the Upper Peninsula. Our organization works on a non profit basis to fund this annual sport fishing event. We greatly appreciate each and every one of you that have sponsored the organization and personal time and effort to make it happen on an annual basis. Please fill out form below to request further information and mailing list.